Article courtesy of MD Dept. of Planning. Outreach for A Better Maryland kicked off with enthusiasm in Garrett County on Monday, November 6. Special Secretary of Smart Growth Wendi Peters, Acting Secretary of the Maryland Department of Planning (Planning) Rob McCord, Assistant Secretary of Planning Services Pat Keller, and Director of Planning Coordination Chuck Boyd, who is also the Project Manager for A Better Maryland, visited local county and municipal community leaders in the county government offices in Oakland and at Garrett College. The project team solicited stakeholder input on what should be in a state development plan and how it can assist local planning objectives. Planning would like to extend a special thanks to Debbie Carpenter, Director of Planning and Land Management for Garrett County, for assisting with meeting organization and local outreach. --What are some barriers to planning in your communities/jurisdictions? planning and a high quality of life in your community? agencies to support good planning and a high quality of life in your community? 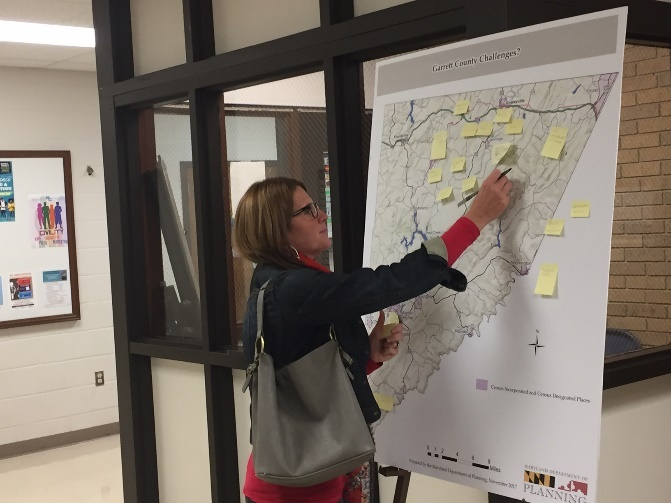 Following the meetings at the Garrett County government offices, the project team invited the community to the Garrett College Auditorium to address similar questions and engage in visioning for A Better Maryland. Planning staff introduced the project and the essentials of a state development plan. This was followed by an instant polling activity using cell phones that provided the project team with quantifiable input and sparked conversation during the listening sessions. Planning will be posting input from all the listening sessions and replicating the polling activity on the project website at ABetter.Maryland.gov, so even those who cannot attend a listening session can provide feedback and engage in the effort. There are many more opportunities to participate in a listening session, with 23 to go and the ones provided below already scheduled. Please note that interested participants should feel free to attend any meeting. If you have a conflict with the one in your county, participate in the one in your neighboring county. The project team, in partnership with local staff and officials, also scheduled the following listening session dates. Please visit the events page on the project website for updates on session times and meeting locations. Planning staff is working hard to schedule sessions in all 24 counties and Baltimore City. If you have any questions about A Better Maryland, please contact Chuck Boyd, Director of Planning Coordination, (chuck.boyd@maryland.gov) 410-767-1401.